This serious anti-aging serum contains Renovage along with the most powerful combination of cutting edge ingredients available to restore healthier, more youthful acting skin. 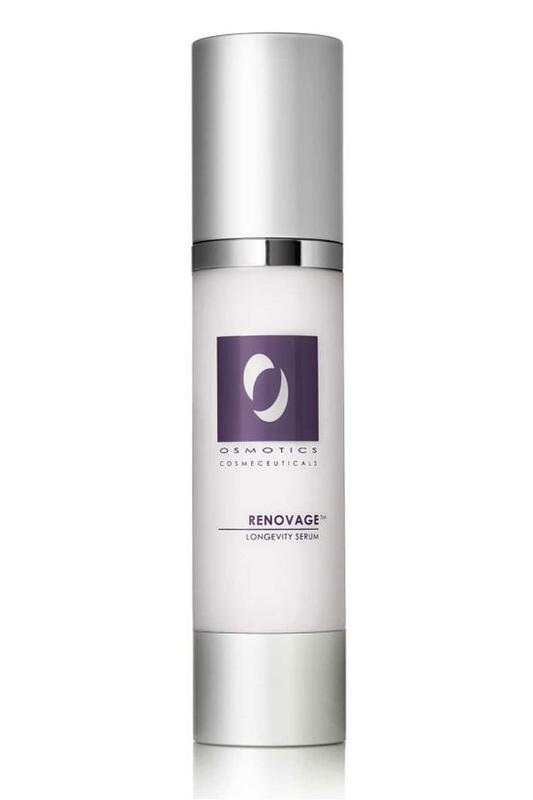 To insure maximum results Osmotics' also included: a patented Tripeptide/Protein combination to promote Collagen, natural extracts to support the extra cellular matrix for smoother, tighter, more toned contours and Ergothioneine, a mega antioxidant proven to be the most effective in its class. Use daily to visibly reduce fine lines, uneven skintone, redness and pore size. This youth extending formula has everything you need to see visible results in 4 to 6 weeks! 1.7 oz. After cleansing, lightly massage over entire face and neck. May be used A.M. and/or P.M. Proceed with your daily skin care regimen. Water, Caprylic/Capric Triglyceride, Aloe Barbadensis (Aloe Vera) Leaf Juice, Methyl Gluceth-20, Glycerin, PPG-2 Myristyl Ether Propionate, Cetyl Alcohol, PEG-20 Methyl Glucose Sesquistearate, Methyl Methacrylate Crosspolymer, Squalane, Simmondsia Chinensis (Jojoba) Seed Oil, Dimethicone, Methyl Glucose Sesquistearate, Carbomer, Diazolidinyl Urea, Palmitoyl Dipeptide-5 Diaminobutyroyl Hydroxythreonine, Tetradecyl Aminobutyroylvalylaminobutyric Urea Trifluoroacetate, Palmitoyl Tripeptide-5, Teprenone, Magnesium Chloride, Spilanthes Acmella Flower Extract, Ergothioneine, Iodopropynyl Butylcarbamate, Tromethamine, Disodium EDTA, Tocopheryl Acetate, Ubiquinone, Zea Mays (Corn) Oil, Retinyl Palmitate, Cholecalciferol, Camellia Sinensis (Green Tea) Leaf Extract, Mica, Titanium Dioxide.